Active Participation: Math is not a spectator sport, it's been said. Teachers who regularly incorporate active participation strategies are better able to assess student proficiency, identify and correct misunderstandings and target instruction to individual student's needs. See Instructional Strategies for strategies that require active student participation in learning. 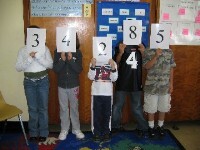 See Number Line-Up for directions for the activity pictured at right and for additional place value activities and resources. Math Templates:The use of whiteboards and templates in sheet protectors allow students to quickly respond to questions, work out problems, etc. Teachers who use these assessment tools are able to easily assess student understanding throughout the lesson. Check out these Mathwire.com resources for some new routines to add to your repertoire of effective strategies. Games to Practice Basic Facts: there are many math games designed to provide student practice of basic facts in lieu of math worksheets. The best games encourage students to master the facts so that they can win points more quickly or identify the best possible move to accumulate the most points. Game Day: Consider adding a "game day" each week to encourage independent pair or small group game practice of basic facts. Students can easily cycle through 3-4 center games in an hour math period. Using this Game Day center approach provides small group instructional time for the teacher to meet with students for reteaching or enrichment. 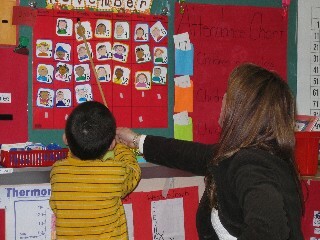 Students simply cycle to the teacher for 1-2 center activities, as needed. Mathwire.com Game Resources: The Mathwire.com game resources pages contain many original games with directions, game boards and recording sheets in PDF format teachers can download to use with students. 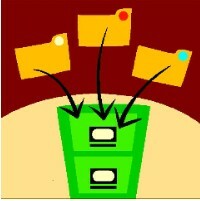 Place the recording sheets in sheet protectors and store in the math game center for the most efficient use. See Math Games for the Mathwire.com Games Resources page with links to games by NCTM standards: Number Sense & Numerical Operations Games, Geometry & Measurement Games, Patterns & Algebra Games, Data Analysis & Probability Games, Discrete Math & Logic Games, Jeopardy Games and Links to Math Game Sites. 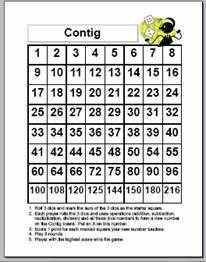 See Number Sense Games for directions and game board for Contig (pictured at left) which encourages students to develop number sense as they add, subtract, multiply and/or divide the numbers of the dice roll to create an expression for a vacant number on the gameboard. 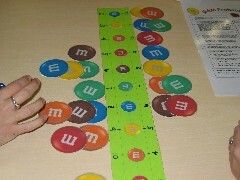 See Data and Probability Games for directions for the M&M Game (pictured above) which combines addition facts with probabiity to create the winning strategy. These activities incorporate seasonal themes while developing mathematical concepts. 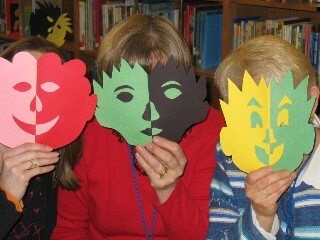 Look for activities that involve pumpkins, scarecrows, spiders, Halloween and Thanksgiving on these seasonal pages. Literature connections, math mats and activity sheets are included for teachers to download for classroom use. See Fall into Math! for pictures and descriptions of suggested fall math activities on this Fall 2005 web page. Resources include Measurement Man, Pumpkin Activities, Symmetric Faces, Jack-o-Lantern Coordinate Graphing Activity, Pictures of Student Work, Pumpkin Problem Solving and Links to Additional Fall Math Activities on the Internet. Coming in September 2006: Fall 2006 Math Activities for more ways to incorporate fall themes into math activities. The resources include Fall Math Activities, Spider Math Games, Bat Math, Fall Glyphs, Fall Coordinate Graphing Activities, Fall Problem Solving. Consider using these sites during instruction if you have an interactive whiteboard or a large display monitor. These sites specifically target using technology to strengthen student understanding of important mathematical concepts. 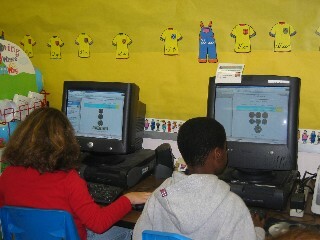 See National Library of Virtual Manipulatives for online library of virtual math manipulatives. See NCTM's e-Example Activities that incorporate technology to help students develop proficiency with important mathematical skills and concepts. 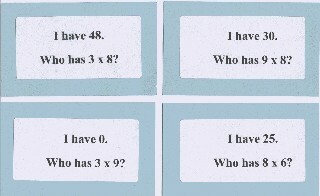 See more Links to Math Topics on the Internet.